Pardon my non sequential postings for a few weeks as I attempt to catch up and get back on track with my weekly assignments for this challenge. I chose to begin with this theme since I had a ready prop that helped me realise a composition I had been envisioning. As a birthday gift(s), the wife presented me with two scale model action figures, Batman and Iron Man. You’ve probably already seen the Batman figure in one of my earlier submissions. 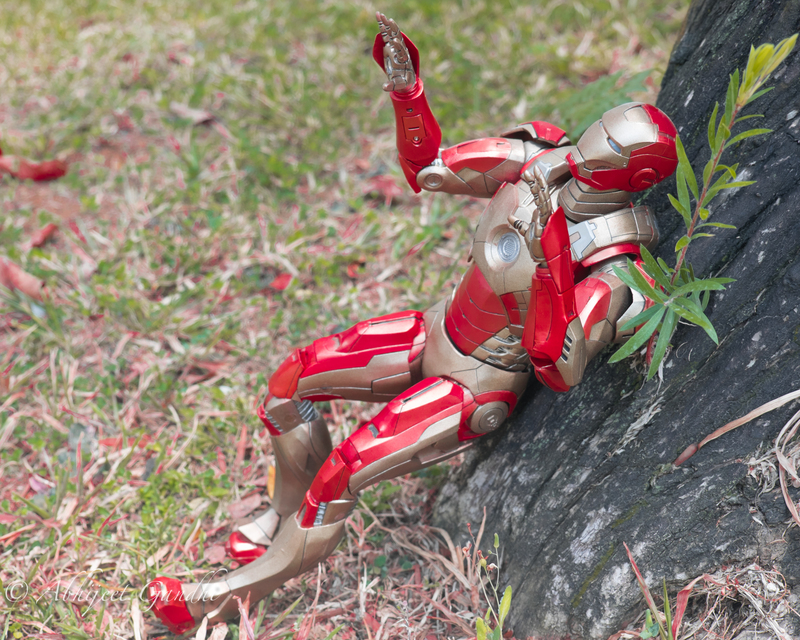 This time around I get to use the other action figure, Iron Man. The weight and scale of this particular action figure require me to keep its limbs in a position that makes it seem like Iron Man is seated. The design of the model is such that when he is kept in this position it almost seems like he is about to fall backwards. Seeing this particular posture made me consider using the action figure as a prop for the week’s theme – Backwards. The scene that I tried to setup was to emphasise that sometimes Heroes also fall back when the odds are against them. I did toy around with the idea of using Photoshop to replace the rather dull landscape with something more fiery and thrilling. But I’m still learning the art of PhotoShopping and wasn’t keen on pouring in hours of trials and errors for that look. The original action figure has a gold and yellow colour scheme for the Iron Man armour, which did not look right to me since I’ve almost always seen him in the trademark Red and Gold armour in comics and movies. So I decided to do some post processing in Lightroom to correct the colour renditions and make them more in line with what looked right to me. Last week I finally succumbed to my inner voice and subscribed to Adobe’s Creative Cloud service. The service gives you access (for a monthly fee either paid upfront for the year or deducted on a monthly basis) to Adobe’s Lightroom, Lightroom Mobile and Photoshop applications. Although I had already purchased the single license for Lightroom, the subscription service became paramount after I received my birthday gift last week, a brand new MacBook Air! Now I can use Adobe’s applications between my desktop (Mac Mini) as well as my mobile devices (iPad and MacBook). The reason I mentioned this is because my image for this week’s assignment is my virgin attempt at using Photoshop. Yes! Finally I am on board the much despised Photoshop bandwagon and I have to say, I am simply blown away! The types and levels of image manipulation possible within Photoshop are simply mind boggling! I’m sure i’ll need another lifetime to learn every one of them, but I certainly will be learning as much as I can to make the most of my photos moving forward. Coming back to the image I shot (and edited! ).My first thought was to take a shot of a rising fist which seems to be the universal symbol of striking “against” the establishment. You can do a quick image search on Google for the word Against and you’ll see numerous variations of “The Fist”. However I wasn’t too sure whether I would be able to get the lighting right and so I abandoned that perspective. My next thought was to use props and convey the theme through action figures. I chose the scale model Batman action figure (another birthday present!) 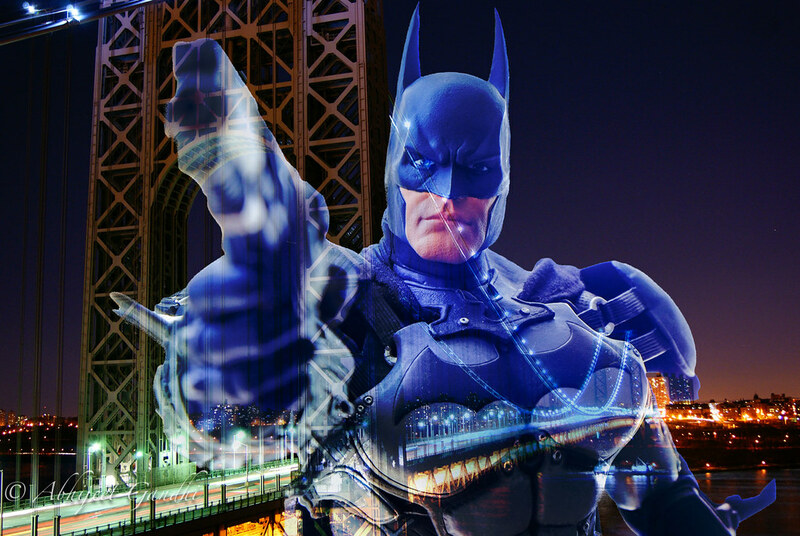 to depict Heroes against crime and shot this image with an overexposed background. Of course the image felt a tad dull with just the action figure in focus. So I decided to spice it up a bit using my newly acquired Photoshop software. Thanks to this great video by Terry White I got a basic primer on the commonly used tools within Photoshop. I decided to use layers to add a background to my original image. Instead of scouring through my image database (I am still in the process of tagging and organising the 20k plus images) I chose an appropriate stock image from the site freeimages. It’s not the best example of Photoshop usage since it’s my maiden attempt. But I’m certain I will leverage Photoshop to achieve some pretty unique compositions that were nearly impossible for me to attempt before.